Former militants from several communities in Delta State have laid siege to the Government House protesting over an alleged attempt by some contractors to take over their jobs. 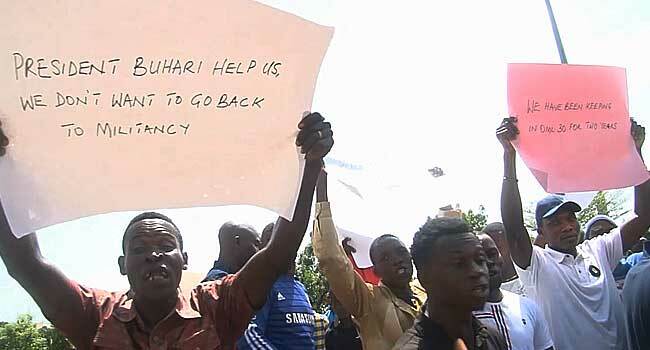 The youths, under the aegis of Host Communities of Nigeria (Oil & Gas), who are captured in the Federal Government’s amnesty programme, marched out on Friday in their hundreds with placards to express their displeasure on the issue. They barricaded the Government House, preventing movement in and out of the premises while chanting solidarity songs and calling on the governor, Ifeanyi Okowa, to come to their rescue. “Your excellency, we feel that this is the point at which you, as the chief security officer of our dear state, must rise up to take steps to nip this madness in the bud to avert the impending danger that this greedy set of ‘soldiers of fortune’ is about to impose on not just our communities, but also our dear state. “You may wonder how this is our concern. It has become our concern because we have sat down to imagine what the picture will look like when ocean marine successfully takes our jobs away from us, using either traditional rulers or president generals of our communities as fronts, how many youths with bustling capacities and abilities will be rendered jobless,” they said. The state’s Attorney General and Commissioner for Justice, Peter Mrakpor, who addressed the protesters said their grievances would be communicated to the governor.